Good morning dear readers! 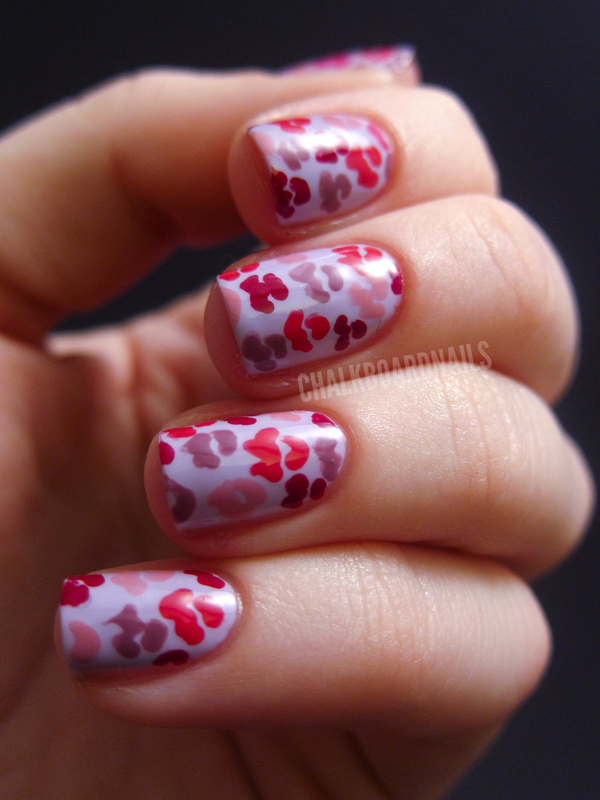 Today I have my first Valentine's Day manicure, and the first freehanding nail art that I have done in a long time! I have been calling this "One Million Kisses" in my head all night, although I can obviously see that there are nowhere near that many. HUMOR ME! 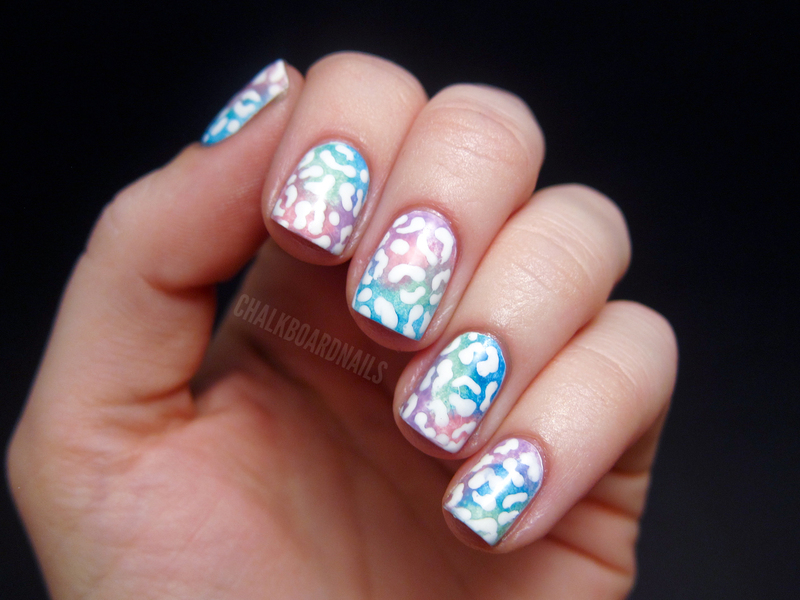 This was a tough manicure, I'm not gonna lie to you guys! 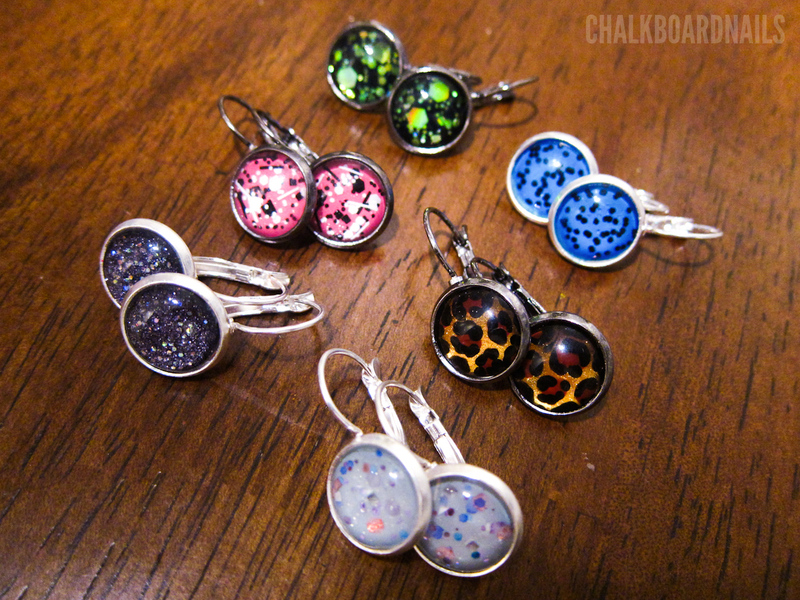 I think I redid these at least three times. Most of my problems were due to my base color choices being too thick though, and then due to that, my lips wouldn't draw on correctly. After trying a few colors as bases and watching them flop spectacularly, I gave OPI Rumple's Wiggin' a shot. It went on gorgeously and easily in two coats, and wasn't thick at all. I was so glad that I was able to get it to work. I was really excited about this idea and was getting frustrated when it kept going wrong! I then freehanded on the lips with the small end of a dotting tool. 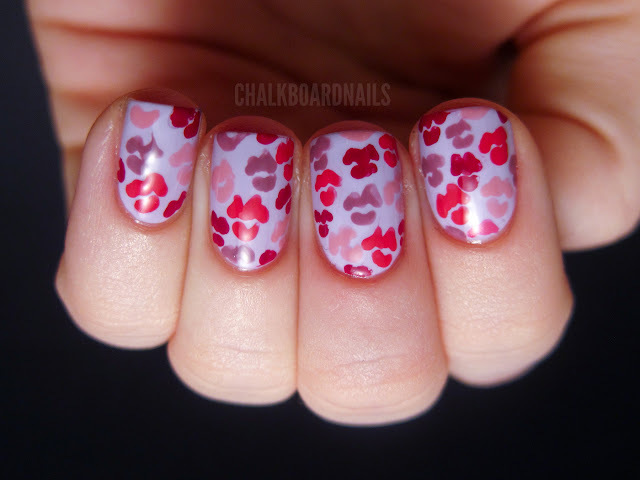 The colors I used were: OPI Manicurist of Seville, OPI Sparrow Me the Drama, China Glaze Heli-yum, and American Apparel Dynasty. I want to take a quick second to mention that I have worn Dynasty as a full manicure before but didn't make a post about it. The formula is AMAZING and I highly recommend it. 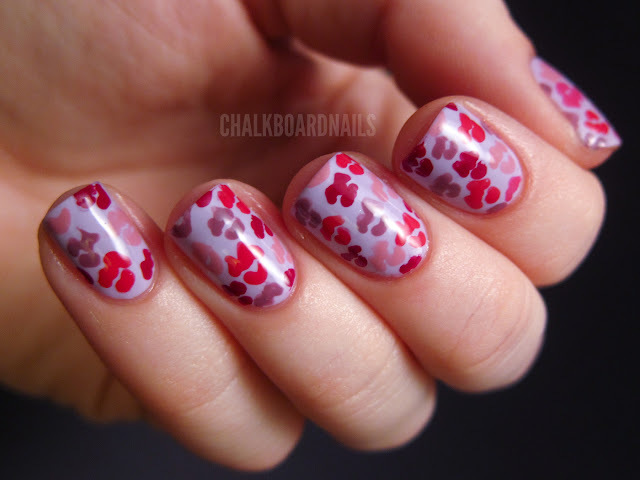 The lips in this manicure aren't perfect -- drawing with a dotting tool is hard! -- but I think that makes it look more realistic, like they are actually tiny little lipstick kisses. Not every kiss would turn out exactly the same. 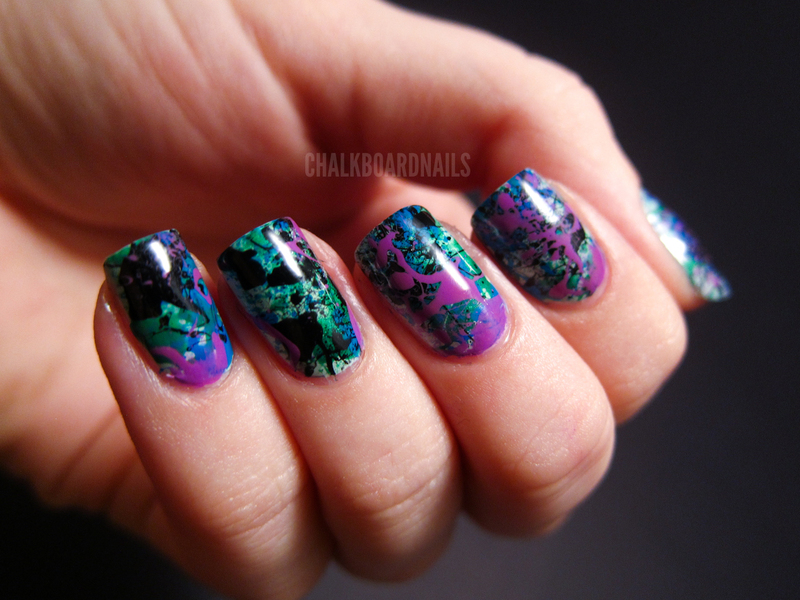 I just love full nail designs, especially with nail art. 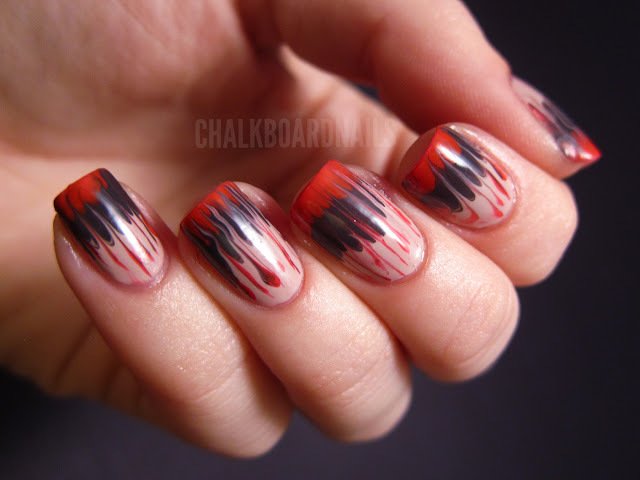 This one could be a sister manicure to my Halloween Eyeball Nails, don't you think? Maybe someday I will do a nose manicure and then I will have done eyes, nose, and mouth manicures. Just kidding... or am I? 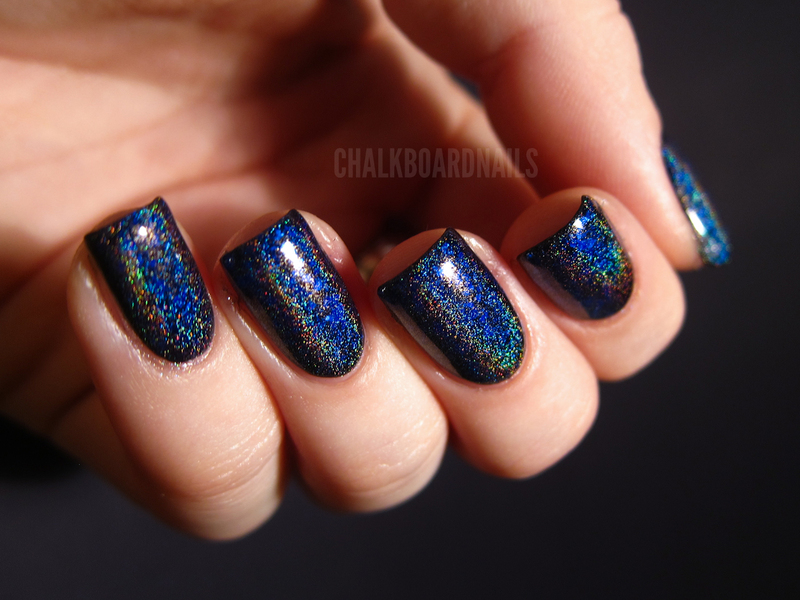 Today I have a super special polish to show you -- a gorgeous creation from Amy at I'm Feeling Nail-Venturous. 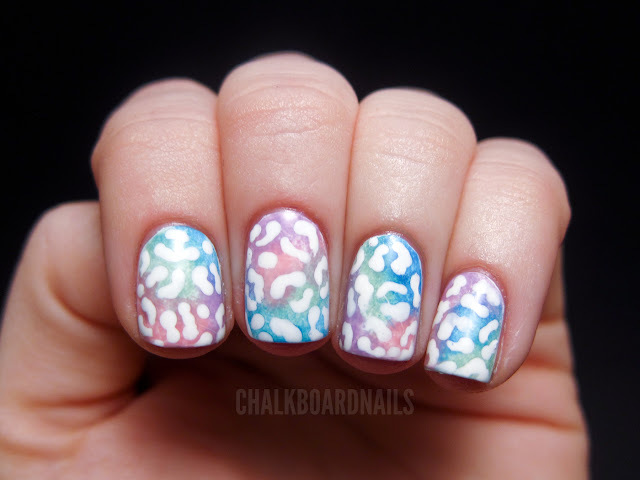 It's called Floam, and it is part of her Nail Venturous Nail Lacquers line. Floam is very unique, and unlike anything else that I have seen before. It is made up of tiny tiny blue and green glitter pieces. Enlarge any of these pics to get a better idea of the texture of the glitter. The last pic in the post will give you a particularly good view of it when blown up. 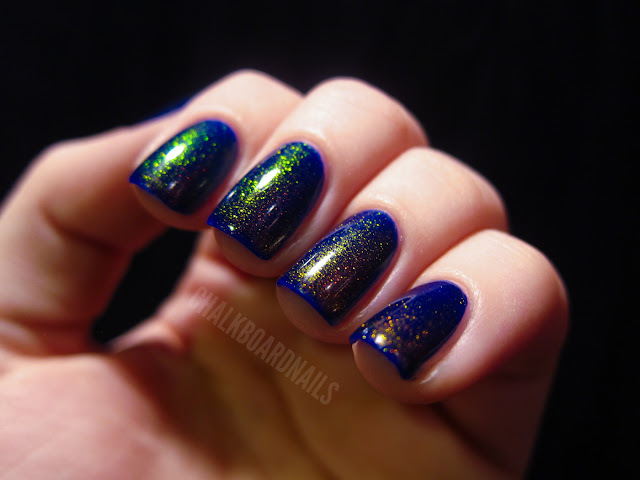 The glitter is so small that when you look at it on the nail, it just looks really cool and speckled. Sometimes this polish looks more blue, sometimes it looks more green. If you squint at it from a distance, the colors blend together into a turquoise color. 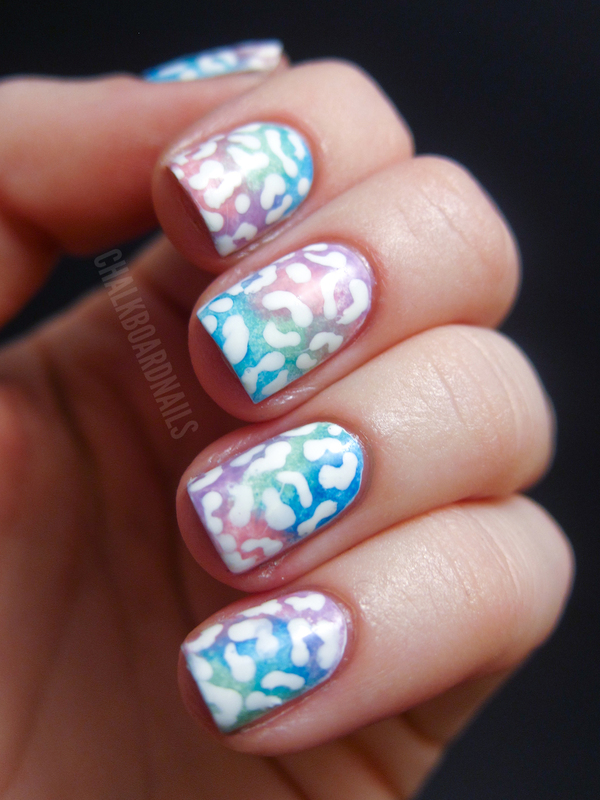 My photos show two coats of Floam. 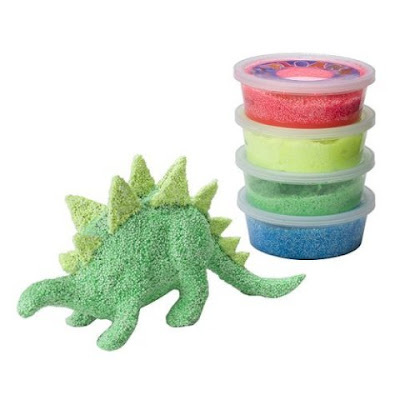 It was named Floam after the 90s toy of the same name. Do you guys remember Floam? Sort of a weird, moldable, textured bubbly thing? 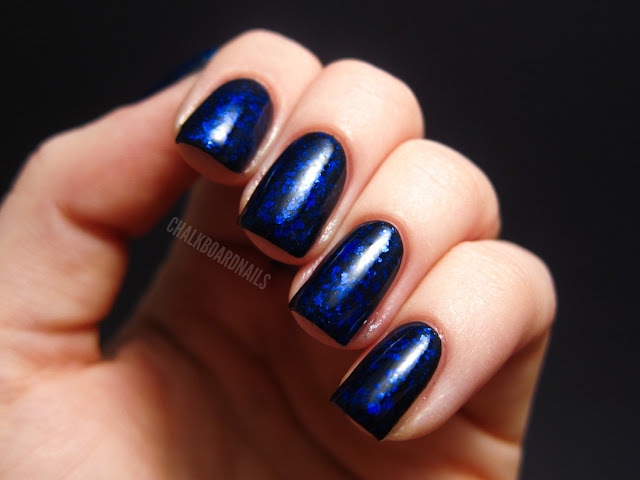 I think the name of this polish is so apt because it really does resemble its namesake! 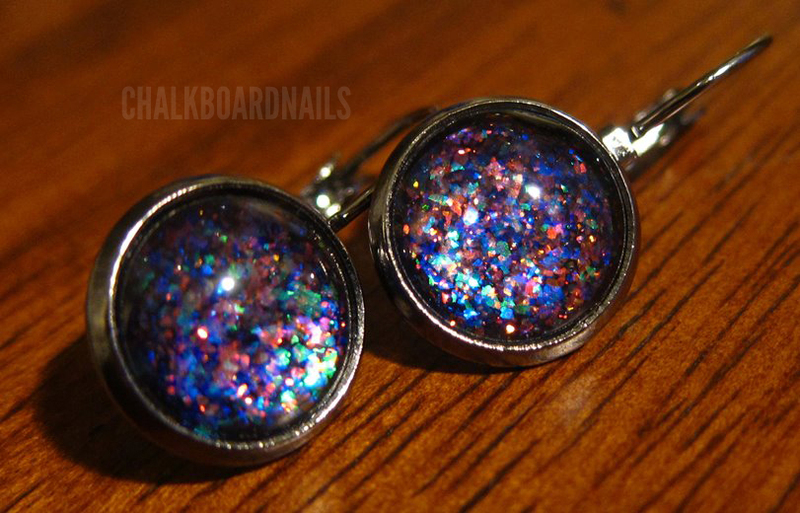 The texture is bumpy, as you might expect from something that is made up of pure glitter. It's workable though, and the texture could be solved with some Gelous and a thick topcoat. Application was surprisingly easy. The polish itself was very thick, so I thought it might be hard to apply. Thankfully, it was not! 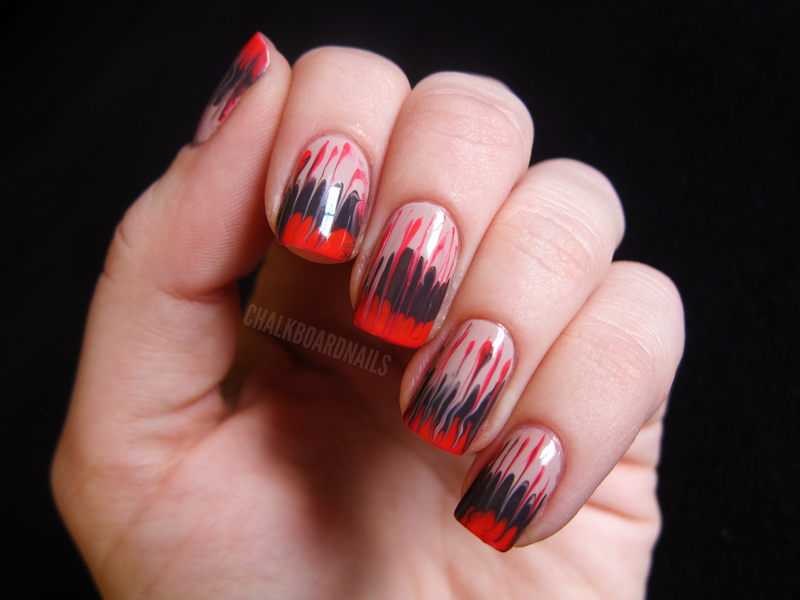 It controlled very nicely, and I didn't have to do any cleanup at all on this manicure. The only thing that I had to be careful about was waiting in-between coats to make sure the previous coat was dry before putting on my next one. 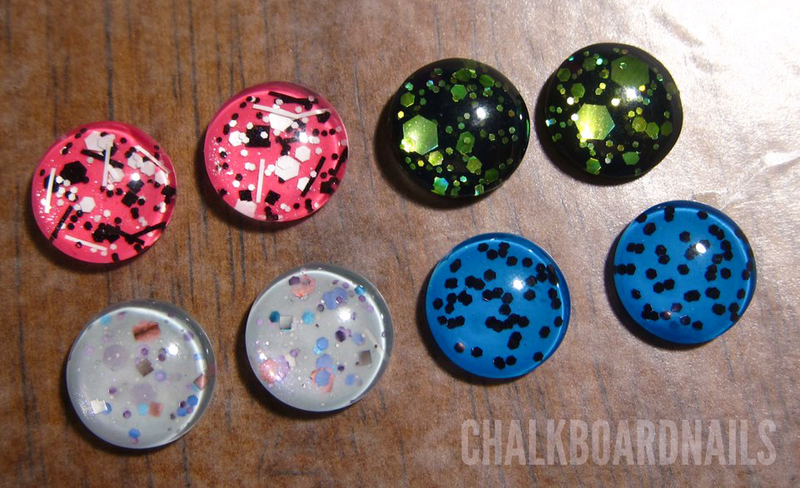 Unfortunately, Amy does not have plans at this time to sell these polishes, as she (understandably!) 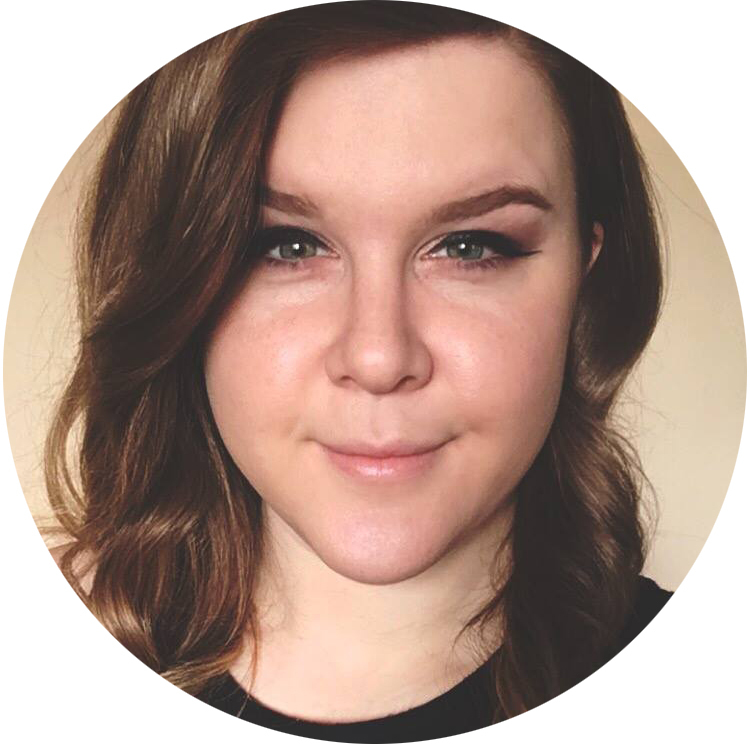 thinks that it will take too much time away from blogging, which she loves too much! BUT, you guys are in luck! She is holding a giveaway for some bottles of Floam, as well as some bottles of Floam's sister polishes, Pinkerbell and Orange You Unique!??!. 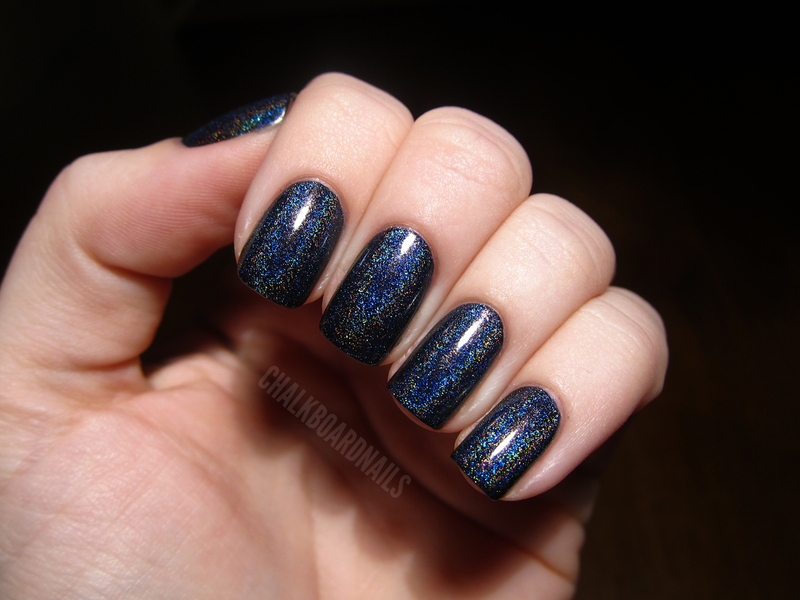 Check out the giveaway over on I'm Feeling Nail-Venturous, and may the Force be with you! Hello everyone! 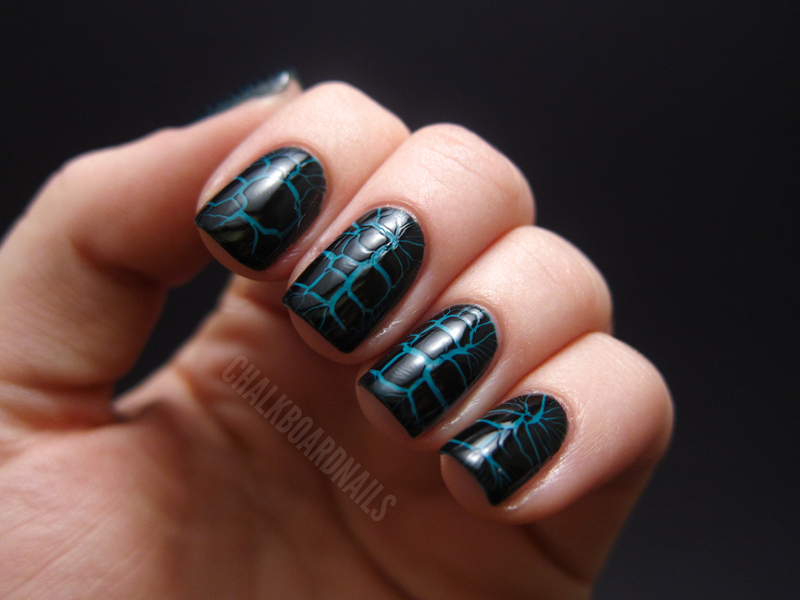 This morning I have another set of nails for you guys that I did "pre break," aka the Nailocalypse 2012. I had been eager to try the needle drag technique again after my first attempt, because THIS BEAUTIFUL GENIUS left a comment on my last post suggesting that I try it with a clean striper brush instead of with an actual needle. As you can see, the effect is a little bit different, but I think it's in a good way! 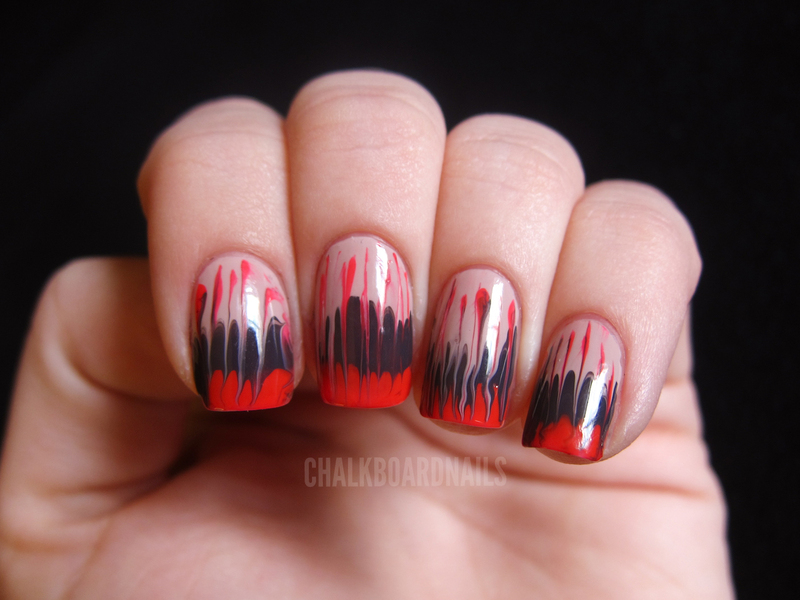 And honestly, this method made this "needle marble" look about a bajillion times easier than the last time I tried it. So exciting! The only hesitation that I had about this manicure was the color combination. I used Zoya Kennedy, Zoya Petra, and Zoya Renee. I was unsure about it at first, and as time went on I only got more and more confused! I couldn't decide whether I liked it or disliked it. Eventually I decided that I mostly liked it. What do you guys think? Good morning! I recently learned about LCN's "Croco Fever" line and have been totally obsessing over it. 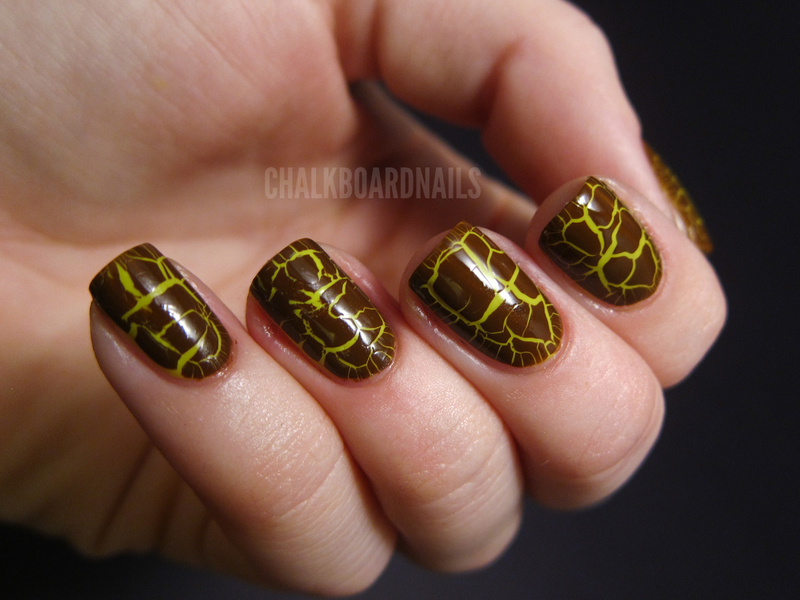 It is a unique type of crackle effect that cracks into a pattern that makes your nail polish look like crocodile skin (scales?). 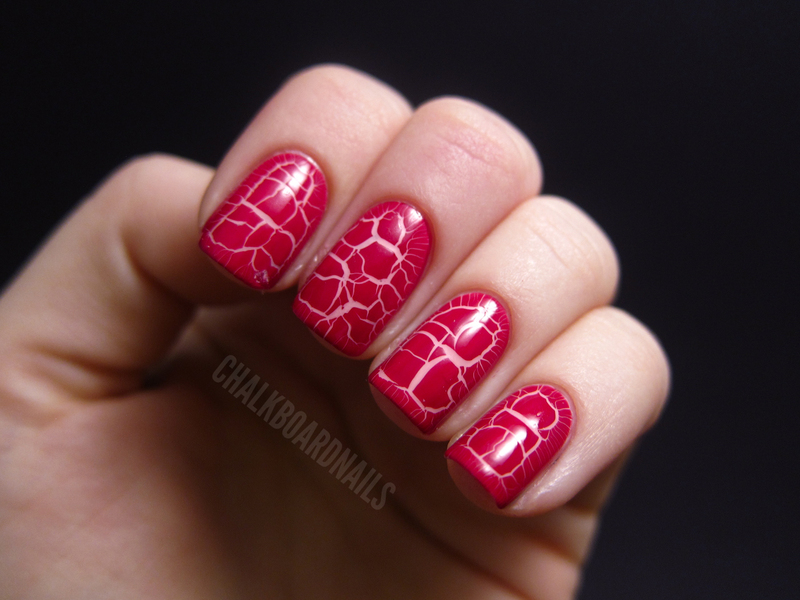 I'm sure many of you are not a fan of the standard crackle look, and I'm with you there. 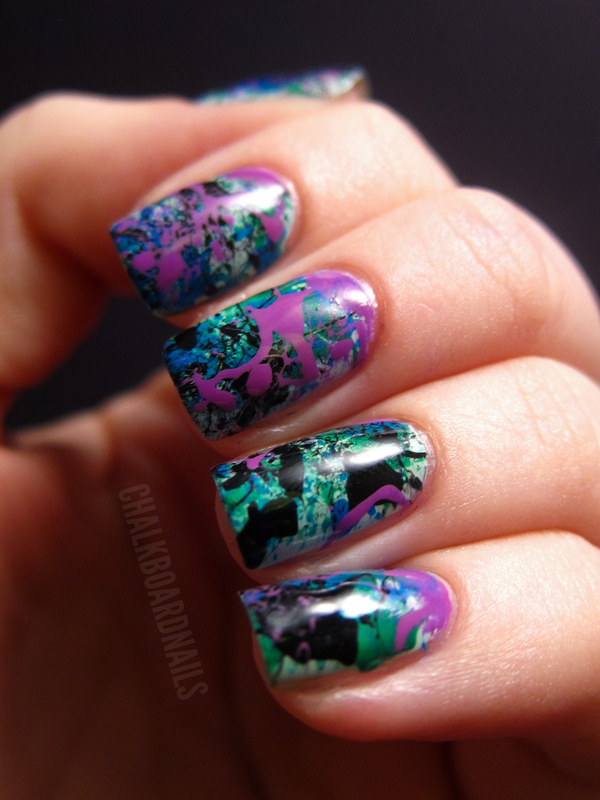 It just ends up looking kind of messy most of the time, and the look is not chic or elegant at all. 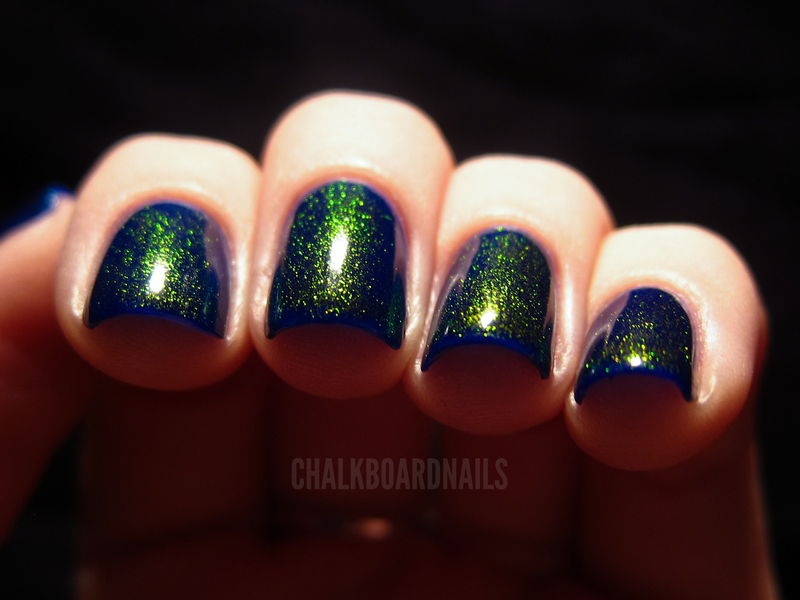 The LCN Croco Fever polishes, however, look quite classy and put a unique spin on the same old tired crackle. The other great thing is that, even with a layer of SV, the Croc crackles retain their texture, so if you touch your nails when they are dry, they will feel like you are touching a Croc pattern handbag. They come in four colors - black (Black Leather), brown (Croco Eyes), burgundy (Ruby Forever), and red (Rescue Red). I picked up all of the colors except the red, which for some reason did not appeal to me as much as the others. I also recently acquired a set of the OPI Nicki Minaj minis, which includes the three cremes from the collection and a glitter. I paired one of each of the cremes with one of the Croco Fever polishes for today's swatches. Here are each of the minis with the LCN bottles. You can see that the LCN bottles are a bit smaller than standard polish size; they are 8ml. It's hard to pick favorites between the three of these matchups, but if I had to, this would probably be my favorite look. 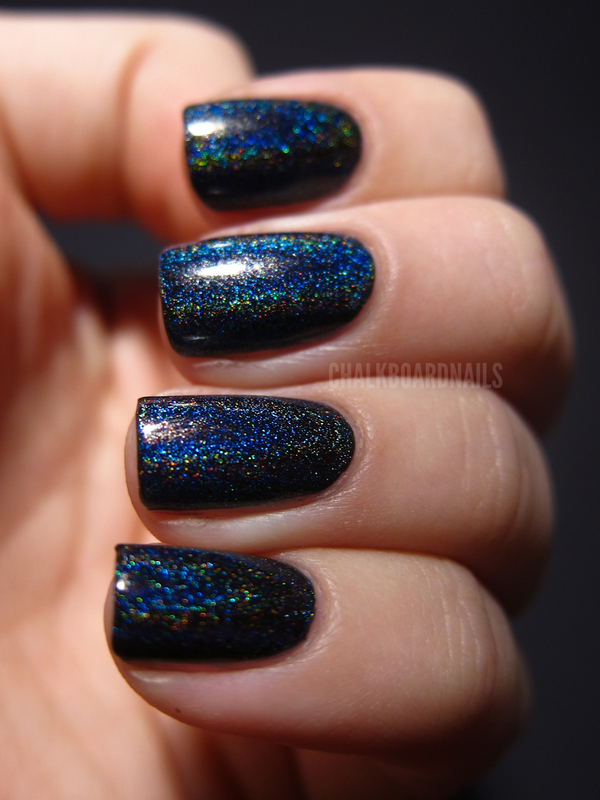 The black goes with basically any polish that you want to wear underneath it, and makes a dark and dramatic statement. For some reason the burgundy Croco Fever polish was the one that most reminded me of a handbag. It is a beautiful, rich red in regular light, and in low light it looks dark and vampy. My photos of it appear a bit brighter than it does in person... I had trouble getting this one to photograph well. 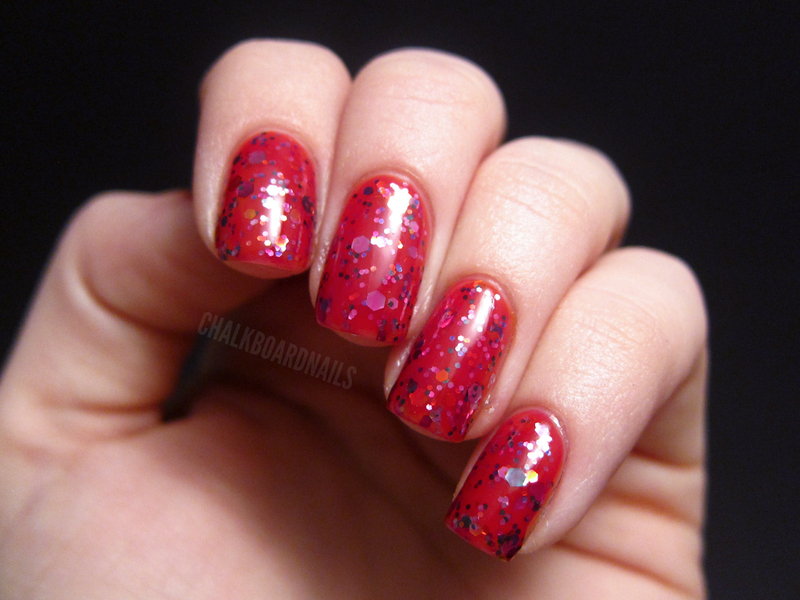 OPI Pink Friday DEFINES "bubblegum pink." 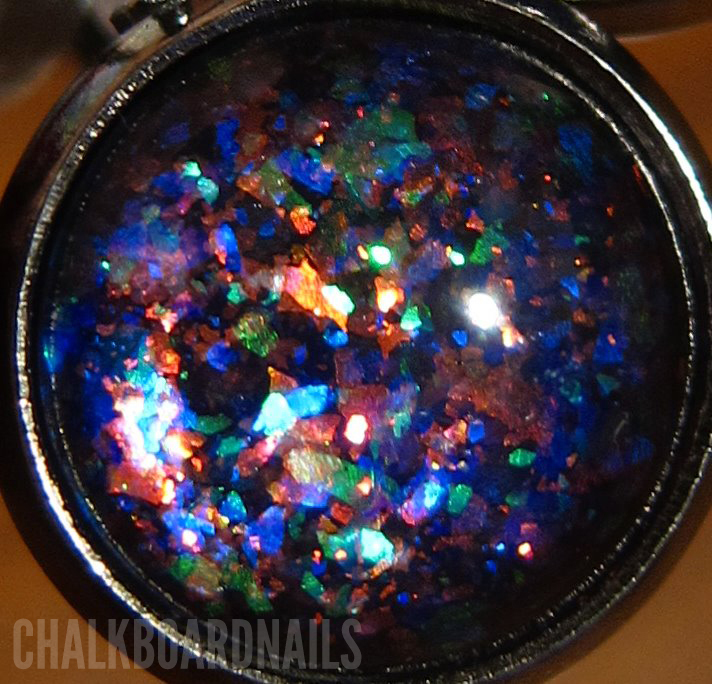 It is a sweet and light color that still is quite pigmented. This is probably the combination that will be the most polarizing. 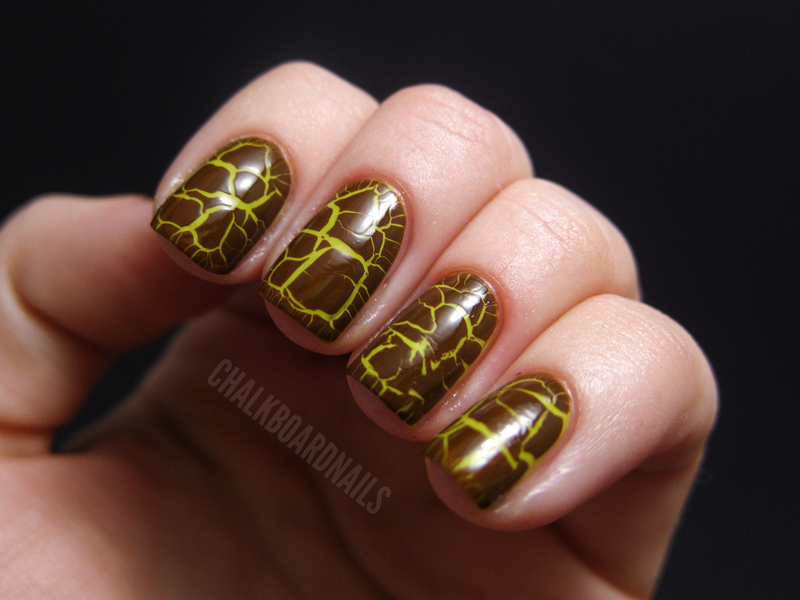 Many people do not like to wear brown on their nails, but I think that the brown in Croco Eyes is just beautiful. 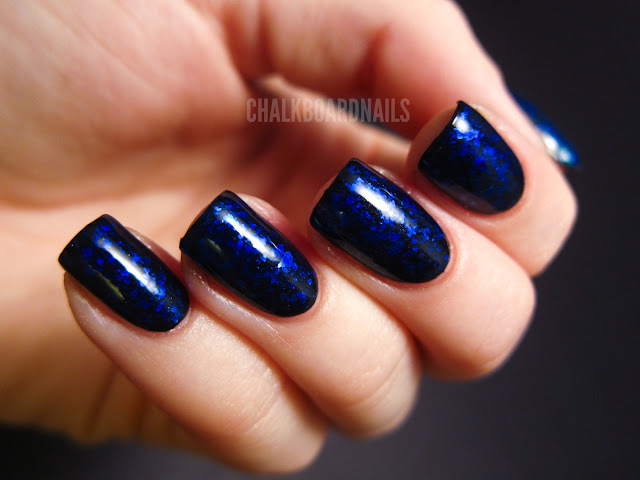 It is luxurious, and if paired with the right base polish, could make a classy and subtle statement. Of course, I didn't go for subtle, and neither did OPI when they made Did It On 'Em. It is what is considered an "ugly" color. You don't need to buy this if you already own OPI Who the Shrek Are You?. Still, it is a very Nicki color and a conversation starter. I personally love it, but I do already own WTSAY, so it is a bit redundant in my stash. 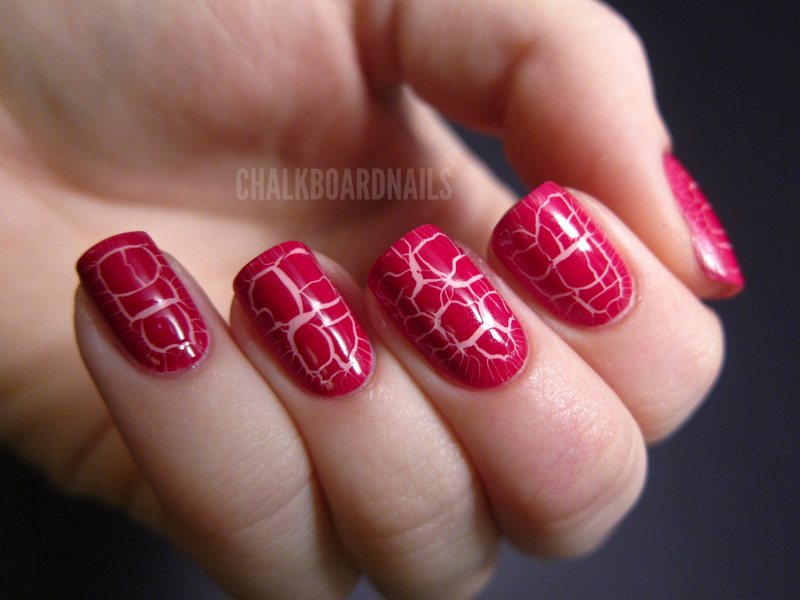 One thing to note about these Croco polishes is that the application differs a bit from regular crackle polish. 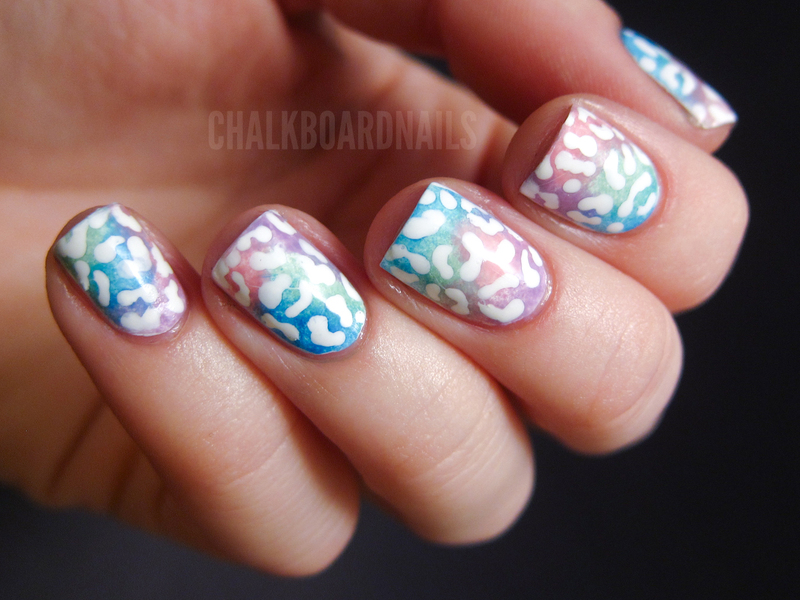 Instead of applying it over dry polish, you are supposed to apply it over slightly tacky/somewhat wet polish. 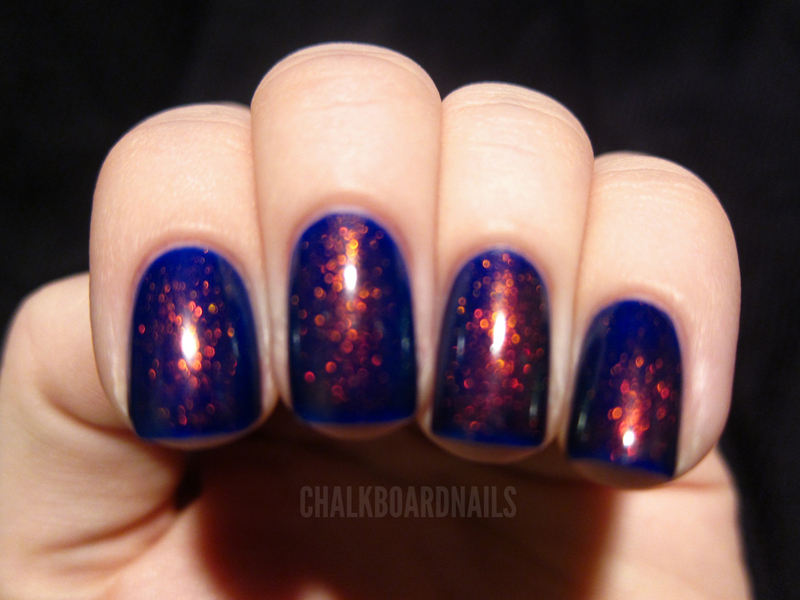 LCN recommends waiting four minutes after applying your base color before applying your Croco Top. Check out this application video from LCN themselves. LCN products can be purchased at http://store.lcnusa.com/ and retail at $9.50. OPI products can be purchased at various salon and beauty supply locations, and retail for ~$8.50. Hello everyone, happy Monday! Monday is such a daunting day, isn't it? To take the edge off, I thought I'd do a dramatic splatter manicure, which is one of my very favorite techniques. I started with a base of China Glaze Re-Fresh Mint, though you can't see that very well anymore! Then, I taped off the finger areas surrounding my nail to make cleanup a bit easier. 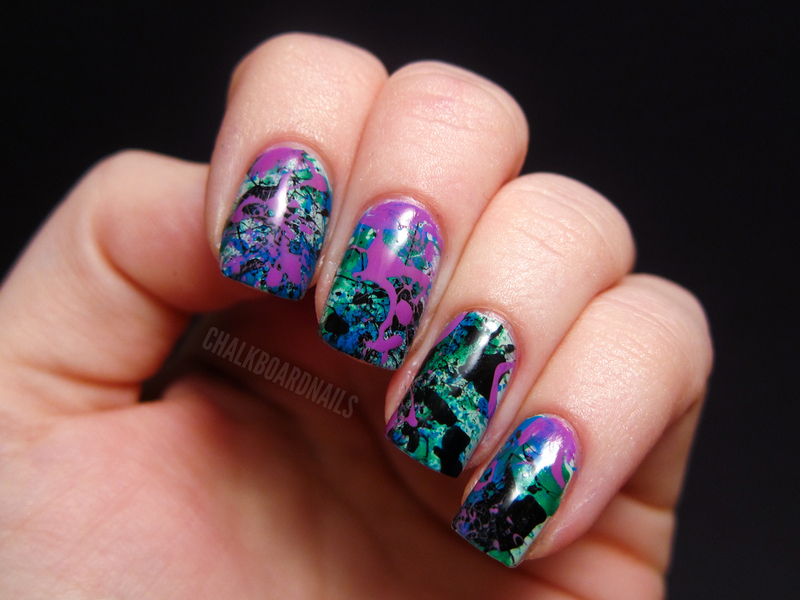 I splattered on Sally Hansen Going Green first, then OPI Ogre the Top Blue, then Wet N Wild Ink Well, then Orly Frolic. I think that it is a good idea to include either black or white in every splatter manicure, as they really stand out from the other colors you choose to include and add a lot of great contrast and definition. When I do splatters, I use a regular drinking straw. Some people prefer smaller straws but the regular sized drinking straws work well for me. I dip the straw directly into the polish, and then do a strong and fast puff of air through the straw on to the nail. The speed and strength of the air is the key to getting a good looking splatter effect. For an in-depth step by step on the process, check out this question I answered on Tumblr a bit ago. I am very pleased with this color combination, in particular. It kind of reminds me of the 80s, or of a Ninja Turtle. The green is clearly the turtle and then the purple would be the color of his eye mask. Which I guess makes this splatter mani Donatello inspired? And yeah, I did have to Google which one wore purple.